I'm Running to Eat! : Another keeper! 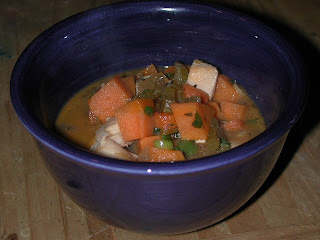 After catching a bit of Rachael Ray's 30 Minute Meals show this week, I decided to make Smoky Sweet Potato Chicken Stoup. It's a thick Stew-Soup with plenty of veggies and chunks of chicken, jazzed up with the addition of canned chipotle peppers in adobo sauce. Chopping took a little bit of time but otherwise this dish was simple to prepare. It did seem to need to cook a bit longer to reduce a bit so I don't think we made it under the 30-minute wire. Pretty tasty with a little zip, I'll likely be making this again! While soup pot heats, chop carrots in half lengthwise then slice into thin half moons. Add the carrots to the pot while it heats, stirring to coat the carrots in the oil. Chop and drop in celery and onion, chopping as small as you can, but don't make yourself crazy.. Add the garlic, chipotle, and adobo sauce and stir to combine. Season the veggies with salt, pepper, thyme, and bay leaf. Cook the veggies together 1 minute. Add the wine and reduce a minute. Add the stock to the pot, cover the pot, and raise heat to high. Bring the stoup to a boil, remove the cover, and simmer for 10 minutes.